Post-mortem resident of Gryffindor House, Hogwarts School of Witchcraft and Wizardry, Hogsmeade, U.K.
A minor character in J.K. Rowling’s Harry Potter saga, Nearly Headless Nick remains one of the most memorable. Executed — badly — on Halloween of 1492, Sir Nicholas de Mimsy-Porpington became the ghost of Gryffindor House. The school has about 20 resident ghosts: the Grey Lady (Helena Ravenclaw) and the Bloody Baron of Slytherin House died violently as well, in a murder-suicide. Rowling says that her editor suggested that she cut a ballad Mimsy-Porpington wrote about himself from The Chamber of Secrets. In the song, the ghost claimed to have been executed for “a mistake any wizard could make,” a “piffling error,” a case of wizardry gone wrong. Asked by Lady Grieve (otherwise unknown) to straighten her teeth, Mimsy-Porpington seems to have given her a tusk. “They” imprisoned the piffler immediately, though he cried all night that he could fix his mistake, and his beheading followed the next morning. My head was still definitely there. Took forty-five goes ’til he floored me. After repeated strokes of the edgeless axe, Mimsy-Porpington finally expired. On festival occasions, he re-enacts his near-beheading, a show quite popular with the Hogwarts student body (Prisoner of Azkaban, p. 159). However, the bone-headed, cloddish headsman was unable to completely behead the wizard. As Ron Weasly notes, the ghost is merely nearly headless. Nick, as played in the Harry Potter films by John Cleese. 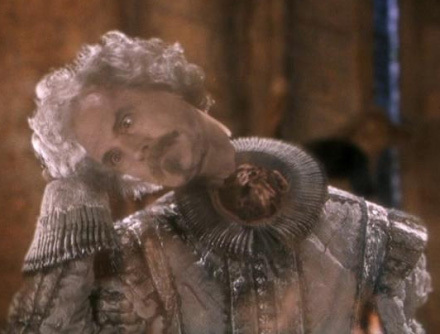 Rowling’s own original sketch of Nearly Headless Nick is here. While he gets a great deal of pleasure from entertaining Hogwarts residents by swinging “his whole head . . . off his neck and . 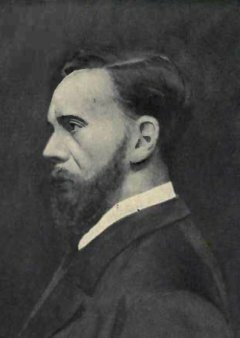 . . onto his shoulder as if it was on a hinge” (Sorceror’s Stone, p. 124), his condition limits his access to the dizziest heights of post-mortem society. Beheading was an aristocratic execution, meant to bring a swift death to the privileged, those able to hunt legally in their lifetime. In the afterlife, the beheaded aristocrats have established a “Headless Hunt” Club, and have blackballed Mimsy-Porpington, who misses their entrance requirements by that much: “‘half an inch of skin and sinew holding my neck on. '” Unable to participate in Club sports like “Horseback Head-Juggling and Head Polo,” Mimsy-Porpington is denied admission into the elite society (Chamber of Secrets, p. 124). Sadly, their scorn for his crippling condition is not limited to exclusion from their company. Mimsy-Porpington’s five hundredth Deathday anniversary party, held on Halloween 1992, welcomes hundreds of ghosts from as far away as Kent to a feast of rotten fish, putrid, “maggoty haggis,” and a tombstone cake with grey icing, while an orchestra of 30 musical saws plays waltzes. 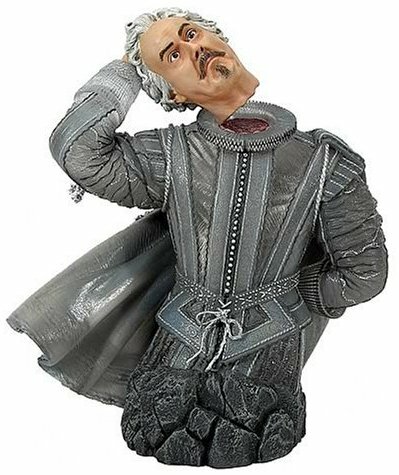 The Deathday Boy’s speech is interrupted by the members of the Headless Hunt: “Sir Properly Decapitated-Podmore” begins a game of Head Hockey, sending his own head sailing past the humiliated Mimsy-Porpington as he tries to address his guests (Chamber of Secrets, p. 132-7). Somehow the courageous Gryffindor ghost overcomes this diabolical heads-up-manship and several months as a petrified cloud to live a useful afterlife, helping Harry many times. Most significantly, in the final pages of The Order of the Phoenix, a traumatized and grieving Harry turns to Mimsy-Porpington, hoping to discover a way to keep his dead friend and guardian Sirius Black alive. “‘You’re dead,'” Harry says, “‘But you’re still here, aren’t you? … People can come back, right? As ghosts. They don’t have to disappear completely. '” Mimsy-Porpington gently tells Harry that he can only “‘walk palely'” where his living self once trod, “‘neither here nor there,'” hovering between life and death for fear of the unknown. However, Black risked his life joyously and died laughing; he will not linger between death and life. Harry must live on without him. There may be historical precedent for Mimsy-Porpington’s death in the botched execution of James Scott, Duke of Monmouth (1685), when the notorious Jack Ketch took five blows to kill the rebel, and finally had to use a knife to sever the last “skin and sinew” connecting the head to the corpse. Monmouth’s hairstyle in portraits from the late 1600s resembles that drawn by Rowling in her sketch of Nearly Headless Nick, although that sketch shows a beard style from the early 1600s, nearly 70 years earlier. Moreover, the ghost enters Harry Potter’s life wearing an Elizabethan neck ruff and says that he has not eaten in nearly 400 years, implying a death in the late 1500s. In spite of this wibbly-wobbly timeline, Mimsy-Porpington’s deathdate establishes the firm chronology of Rowling’s series: the five hundredth anniversary of his death in 1492 would fall in 1992; therefore the events of Chamber of Secrets (published in 1997) must occur in 1992. The dating of the series is confirmed five books later by the tombstones of Harry’s parents, who died on Halloween Day, 1981 (Deathly Hallows, p. 328). For J.K. Rowling, death, the last enemy — not life — marks the measure of this world’s time.